Interbay Meat Market: Good Sandwiches S.O.G. On Saturday we ventured South of Gandy (SOG) to Interbay Meat Market about a stone's throw from MacDill Air Force Base. I had never been to Interbay Meat Market before but knew it was well-known for its sandwiches. I did some quick reading before our trip and found out that Interbay is owned by the Shoubaki family and has been a SOG staple for the past 20 years. Now if you're looking for an upscale deli in a fancy neighborhood then Interbay Meat Market is definitely not your place. However, if you're looking for oversized and tasty sandwiches at great prices (one of the specials on Saturday was a large fried chicken sandwich, fries and a drink for $4 bucks!) than you'll love Interbay. The place is a combination grocery/butcher shop/deli and it was busy on Saturday when we stopped by for lunch. I ordered a grouper sandwich "all the way" in Interbay lingo (with everything on it) and my fiancee Traci ordered an Italian sausage sandwich. We also split a side order of black beans and rice. The crispy Cuban bread Interbay uses is some of the best I've had and the black beans and rice were tasty. Next time I plan to try one of their Cuban combo plates. I had a few bites of Traci's sandwich and thought it was good too, although the sausage was milder than I like. Both sandwiches were stuffed and for being "regular" size were more than enough to eat. My grouper sandwich was easily one of the best I've had since I've lived in Tampa (keep in mind I've been here about a year now after living in Orlando for seven years), although I must admit that I'm just not a big fan of the grouper sandwich. Fish sandwiches to me in general tend to not have enough flavor and are too mild. Now fried shrimp, oysters or soft shell crab poor-boys (on French bread of course for this New Orleans native) are a different story. Bottom-line: This no-frills sandwich shop & deli serves up great sandwiches at equally great prices. Most people get their sandwiches to go, but there is also picnic tables outside. 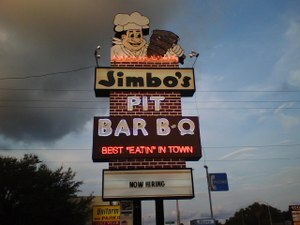 Last Saturday Traci and I were craving some barbecue so we headed to Jimbo's Pit Bar-b-que on W. Kennedy Blvd in Tampa. Now Jimbo's isn't the same caliber of 'cue as we had last week at Newberry's Backyard Bar-B-Q, but Jimbo's has usually been good in a pinch. Saturday was no exception. Jimbo's has been serving up good no-frills, home-style barbecue in the same location on Kennedy since the seventies. There is a sister location in Lakeland. I was told on a previous visit that Jimbo's was started by two brothers- one opened and managed the Lakeland location, the other opened up the Tampa location a few years later. On this visit I ordered a Jimbo's salad with barbecue chicken on top (I like using Jimbo's warm barbecue sauce as my salad dressing but their homemade blue cheese is good, too), while Traci ordered an oversized hamburger and fries. I've tried their barbecue pork, beef and many of their side items (the hush puppies are particularly tasty, gotta love fried dough) and all of them are pretty good, although the homestyle fries are mediocre. The menu is simple, as any good barbecue place should be, prices are inexpensive and service is quick and friendly. Again, Jimbo's won't knock your socks off, but it does the trick when we're in the mood for barbecue. Other Tampa Bay area barbecue joints that are on my list to check out are Big John's Alabama BBQ on N. 40th St and Hickory Hollow in Ellenton. One local place that barbecue-wise I found mediocre was Kojak's House of Ribs on Gandy near Bayshore. The outdoor patio seating at Kojak's is nice and I know the place has been there forever like Jimbo's, but the food needs to at least be above average and Kojak's certainly wasn't. Bottom-line: While Jimbo's barbecue may not be award-winning, it's better than average and certainly does the trick in a pinch. There's also a drive-thru if you'd rather get your 'cue to go. Keep in mind the drive-thru isn't "instant", which is a good thing. Inspection Scorecard: Last inspection: May 2006 violations - Critical (4), Non-Critical (4). 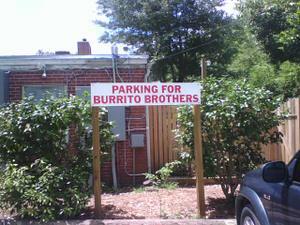 Burrito Bros: What's the Big Deal? Back in April the local papers reported that Burrito Bros. Taco Co., the fresh-mex hole-in-the-wall across from the UF campus in Gainesville, was opening its first ever franchise location in Carrollwood. There is reportedly also plans to open another location in South Tampa. While I haven't eaten yet at the new Carollwood location, I did have a chance this past week to eat at the original Burrito Bros. - well sort of. It turns out that Burrito Bros is currently operating out of a temporary location, while the building that has housed the restaurant for nearly 30 years is renovated. 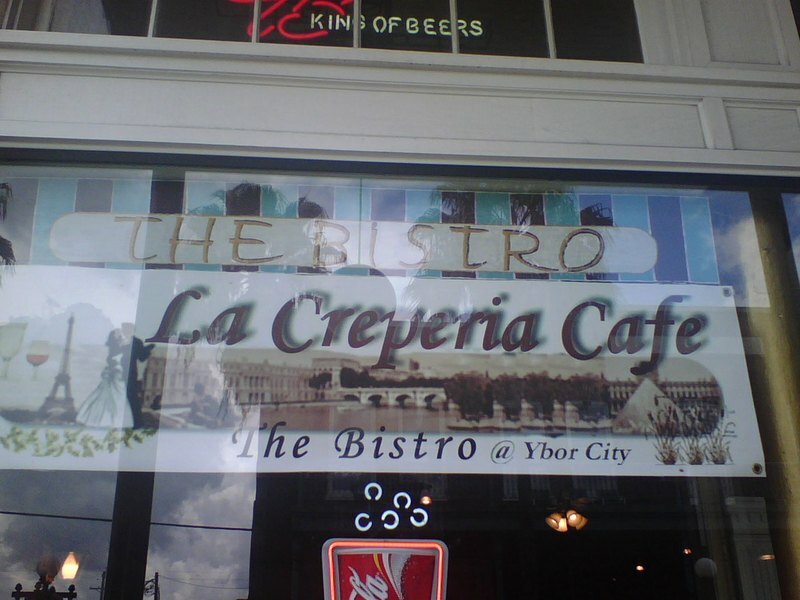 I was curious if the food was really as good as former UF students rave about or if their passion for Burrito Bros. was more of a nostalgia "memory lane" thing. My lunch experience last week (granted this was at the temporary location) suggests the latter. The food was simply good, certainly not great. I ordered three crunchy tacos (two beef, one chicken), my bride-to-be Traci had a chicken burrito and we split an order of corn chips and guacamole. While the guacamole was some of the best I've ever had, the tacos were only average. I had a bite of Traci's burrito and thought it was fairly average, too. While I normally go with independents over chains, I'd choose Chipotle next time over Burrito Bros. I've eaten at multiple Chipotle locations well over a dozen times, and while I have my occasional gripes, the food is always tasty. 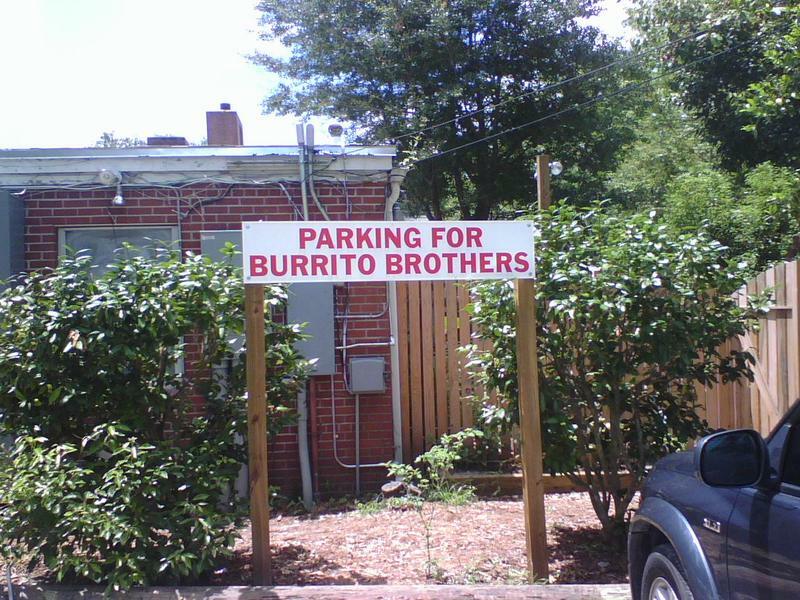 I hope the new Burrito Bros location in Carrollwood does well, but I think they're in for a tough fight with Chipotle, Tijuana Flats, Moe's et al popping up everywhere. As a side note, we also ate at Satchel's Pizza and Newberry's Backyard Bar-B-Q (Newberry is a 20 minute drive from Gainesville) while we were in town. Satchel's was worth the 40 minute wait- their house salad was delicious and their thin crust pizza was a winner. There is also a cool "junk store" behind the restaurant. As for Backyard Bar-BQ, I love good barbecue and this place is now definitely on my list of favorite down-home barbecue joints. Bottom-line: I'll cut Burrito Bros. some slack because they're in a temporary location right now, but I still don't see what all the fuss is about. The food was good, but not great. There's other independent taquerias (TQ's in Hyde Park comes to mind) they can take lessons from. Inspection Scorecard: Last inspection: April 2005 violations - Critical (8), Non-Critical (2). 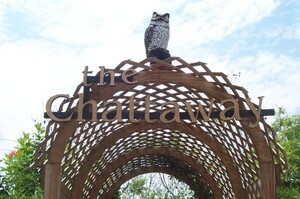 Saturday afternoon we stopped at Chattaway's on 4th Street in southeast St. Pete for lunch. 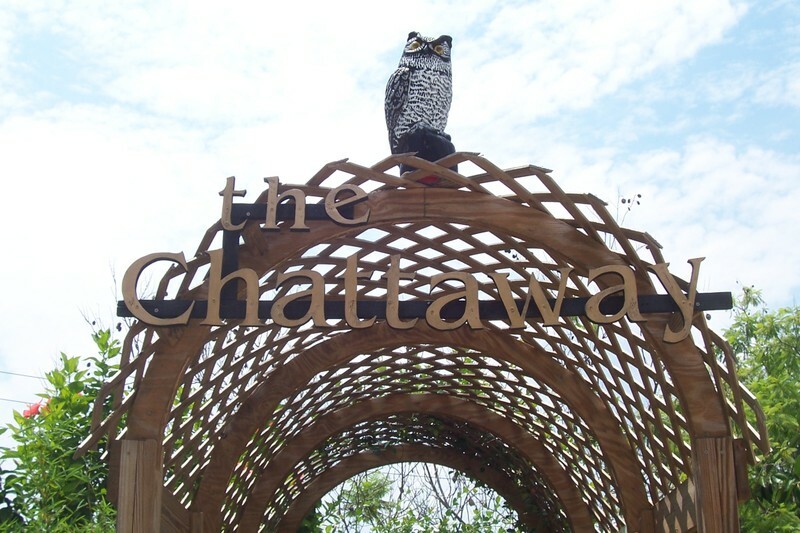 If you've never passed by Chattaway's or eaten at the place before (we sat outside up at the bar) it sort of reminds me of a tree house without the tree and the ladder- if that is possible for a restaurant- with its likable ramshackle-and-homey look. How can I not like a place that wryly announces on its menu that it is "the alternative to the Don" as in the luxurious Don CeSar resort on St. Pete Beach. Chattaway's, which has been going strong now for 55+ years, regularly makes the list of best burger places in Tampa Bay. Of course, this meant I had to put the place to the test. In addition to ordering a Chattaburger for myself (Traci ordered the "big red"- a spicy chicken sandwich), we decided to get an order of onion rings, too. I'm glad that we did. The onion rings were a meal in themselves and the batter and taste reminded me of hush puppies. Traci enjoyed her "big red" (it was spicy and dripping with hot sauce which always wins points in our book). I now understand why Chattaway's is praised for their burgers. This wasn't the biggest cheeseburger I've ever had, but it was one of the tastiest. When your burger is such a dripping mess that it gets on your shirt (this does happen fairly often for me) you know it's good. 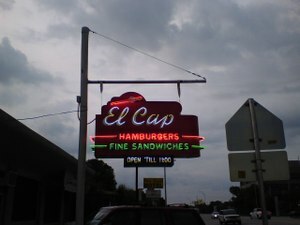 Service was friendly, the food is great, prices are inexpensive, just come prepared for cash-only. Bottom-line: For dripping-good burgers and lots of great-tasting side items in a funky outdoor garden, Chattaway's in St. Pete is the ticket. Definitely not for health nuts! RattleFish: Still Tasty, But For How Long? On Friday night we headed over to RattleFish Raw Bar & Grill which is tucked away off Westshore and Tyson in south Tampa. 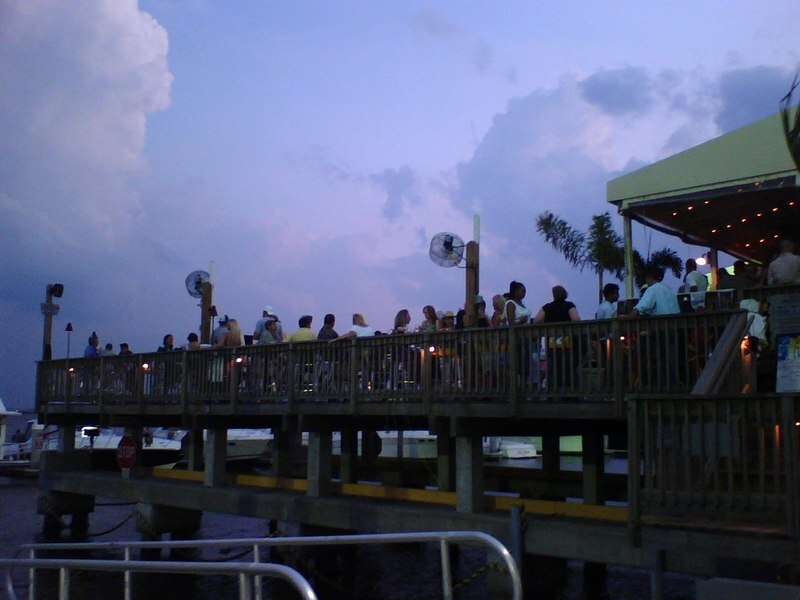 RattleFish is located on the edge of the planned NewPort Tampa development and is also next to the new WestShore Yacht Club. In June, the Trib reported that the owners of RattleFish are selling the popular restaurant and the marina, which has only been open a few years, to a developer who plans to turn the spot into a high-end "dockominium" for boaters. The developer reportedly intends to make RattleFish into a private restaurant/club house within 16 months. The restaurant plans at least sound foolish. I could live without some of the try-too-hard-to-be-trendy crowd that frequents RattleFish (particularly the bar area), but the place consistently has good food and a relaxing island vibe that doesn't feel like Tampa. Too bad the food quality is likely poised to head downhill when the place gets converted (how many really great meals have you ever had at most country clubs? I've had very few!). Anyway, I guess we can enjoy the "real RattleFish" while it's still here. On Friday night we had warm crab and spinach dip with chips as an appetizer. I ordered the chopped salad with grilled shrimp and Traci had a blackened chicken sandwich (the bun was soggy, not good) with slaw and fries. My salad was tasty and the New Orleanian in me loves that RattleFish's croutons are spiked with Tabasco. My favorite dish out of our several visits to RattleFish has been the fish tacos (not unique anymore, but tasty) and the seafood margarita (a delicious chilled salsa and seafood dip). The outside deck area is great for drinks and sunsets. Bottom-line: Check out the "real RattleFish" sometime soon for good seafood and a relaxing island vibe before it gets absorbed into the latest South of Gandy upscale development.